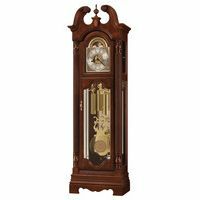 This canted end curio clock with softly arched bonnet features glass access panels, allowing full view of the clock's movement. The lighted top section has two glass shelves as well as two adjustable shelves in the pendulum area. A mirrored back case adds sparkle to any display. 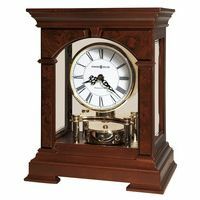 Oak Lawn finish on select hardwoods and oak veneers compliment a polished brass finished dial with black Roman numerals and stationary astrological moon dial. A harp pendulum with 6 1/2"e; (165mm) polished brass disk and polished brass weight shells. The front door comes with a lock for added security. 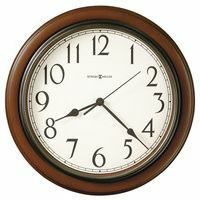 A free engraved brass plate is included with this clock.